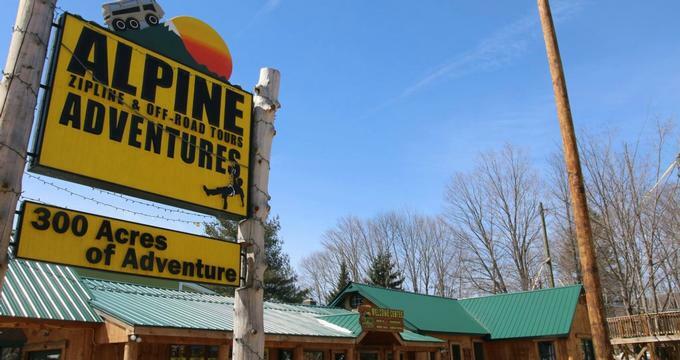 Located in the scenic White Mountains, NH, Alpine Adventures opened in 2006 with the first, fastest, and highest Zipline Canopy Tour in New England. It wasn't long before the company added the SkyRider and Super SkyRide Zipline Tours to its 300 acres of in Woodstock. To reach the zipline tours, visitors are transported in Pinzgauers, Swiss Army transport vehicles, which are also used in the Off-Road Adventures. The Thrillsville Aerial Park at Alpine Adventures features the Climbing Tower, a treehouse, ziplines, rope ladders, cargo nets, bridges, and much more. The park also includes the BigAirBag© Stuntzone and a Quick Drop free-fall device. Visitors can get an adrenaline boost by tubing down the Colossus Stunt Damp and flying through the air into a giant air bag. The self-guided aerial course of Thrillsville introduces guests to exciting ziplines and challenges obstacle courses before they try the much larger versions, SkyRider, Super SkyRider, and the Treetop Canopy Tour. Alpine Adventures' Tree Top Canopy Tour is New England's first true "treetop" canopy tour. Six different ziplines range from 250 feet to 1,000 feet in length, and travel through the treetops up to eighty feet above the ground. This is a great course for those who have never tried ziplining before or families with young children. The obstacles and ziplines become progressively longer and faster, ending with the Zip Six, an option 45mph free-fall. Beginning with a descent from fifty feet off the ground inside Treewalk Village, the SkyRider Tour offers amazing views of the western White Mountains. Dual ziplines offer a chance for guests to race their friends to the Montego Bay Express, Hemlock Walk, and Area 51. SkyRider features five suspended bridges and five ziplines at a height of up to two hundred feet above the forest floor from 800 to 1,600 feet in length. The adventure ends with the "White Knuckle Pine," with speeds up to 50mph and an eighty-foot drop. The Super SkyRider Tour has more lines and is faster, higher, and longer than any other zipline tour. This tour was designed for visitors wanting a more challenging and thrilling adventure with faster speeds and spectacular views. In addition to the extended Off-Road tour and new ziplines, participants will get more climbing elements, higher platforms, more suspension bridges, and two "zap-lines," a spin on the traditional zipline where it's up to the person to get to the other side. The zipline tour takes about three hours to finish and is available on a limited schedule. The Off-Road Adventure Tour at Alpine Adventures transports visitors to the top of Barron Mountain to take in spectacular views during a low-speed roller coaster ride. Each season offers a different off-road tour. Summer offers great weather that can be enjoyed from the vehicle courtesy of a convertible top. Fall provides amazing foliage seen from above the trees, as well as with the occasional turkeys, deer, and moose seen along the trail. The extreme off-road capabilities of the Pinzgauers are displayed in the winter, while spring brings mud.